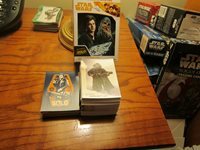 STAR WARS "SOLO" 2018 (BASE SET "100" + 5 COMPLETE CHASE SET'S)!!! 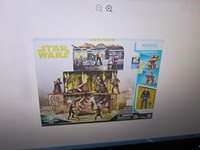 STAR WARS "WALMART EXCLUSIVE/SOLO" 2019 (KESSEL MINE ESCAPE PLAYSET W/HAN)!!! 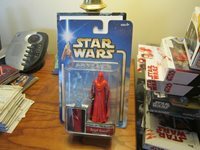 STAR WARS "REVENGE OF THE SITH" 2005 (MUSTAFAR SENTRY "Sepatist Guard" #56)!!! STAR WARS 2009 "THE CLONE WARS" (ANAKIN SKYWALKER "W/Space Helmet" CW21)!!! 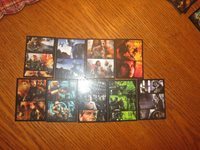 STAR WARS "JOURNEY TO THE FORCE AWAKENS" (BASE/GREEN/DESTINY/CAPTIONS/++)!!! STAR WARS "SAGA/AOTC" 2002 (ORN FREE TAA "Rutian Twi'lek Senator" #35)!!! STAR WARS "BLACK SERIES/TFA" 6 INCH 2015 (CAPTAIN PHASMA #06)PURCHASE4/FREES&H!! STAR WARS TFA/BLACK SERIES" 6 inch 2017 (LUKE "Jedi Master")PURCHASE4/FREES&H!! STAR WARS "JOURNEY TO THE LAST JEDI" (BASE/DESTINY/FAMILY/DARKNESS++)!!! STAR WARS "REBELS" 2016 (KANAN JARRUS "Stormtrooper Disguise" + Accessories)!!! STAR WARS "30TH ANNIVERSARY 2008 (2-1B "Darth Vader's Surgical Droid" #06)!!! 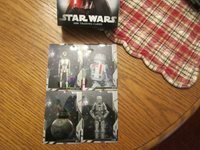 STAR WARS "TARGET/SOLO" 2018 (6-pack MUD TR/HAN/STORMTROOPER "YOU PICK" READ)!! STAR WARS "SAGA COLLECTION" 3 3/4 2006 (CHEWBACCA "Boushh's Bounty" #005)!!! STAR WARS "SAGA COLL" 2006 (IMPERIAL SSNOWTROOPER "Attack On Echo Base" #011)!!! 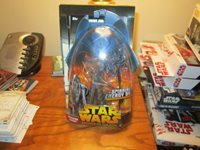 STAR WARS "TOY'S R US EXCLUSIVE" 2011 (CLONE COMMANDER BLACKOUT "Stealth Ops")! 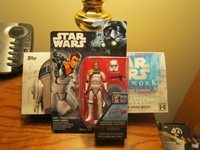 STAR WARS "MOVIE HEROES" 2012 (CLONE TROOPER "91st Mobile Recon" MH11)!! 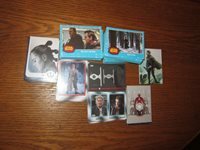 STAR WARS "THE LAST JEDI" 2017 (MEDALLION CARD'S "SINGLE'S")!!! 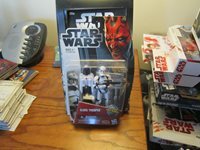 STAR WARS 1999 "EPISODE I/COMMTECH 3 3/4" (DARTH MAUL "Sith Lord" .0000)!!! STAR WARS "30th ANNIVERSARY/ANH 2007 (BIGGS DARKLIGHTER "Toshe Station" #17)!!! 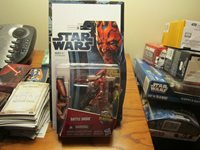 STAR WARS "MOVIE HEROES 2012 (BATTLE DROID "Maroon/Geonosian Arena" MH04)!!! 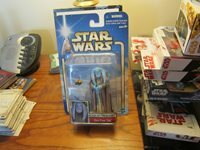 STAR WARS "ATTACK OF THE CLONES" 2002 (ROYAL GUARD "Senate Security" #19)!!! STAR WARS "FINEST" 2018 (DROID'S, & VEHICLE'S "YOU PICK" LOOK)!!! 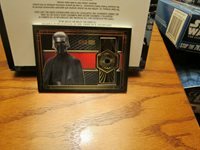 STAR WARS ROGUE ONE: MISSION BREIFING 2016 (COMIC CARD'S "SINGLE'S")!!! STAR WARS 2009 "SAGA LEGEND 3 3/4" (DARTH VADER "Echo Base Attack" SL06)!! !